Improving student learning outcomes using performance data is vital to the growth and development of post-secondary students. Students are increasingly seeking personalized information and feedback to guide their self-directed learning efforts and academic choices. 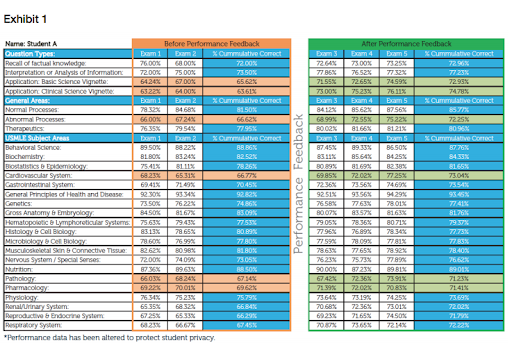 The application of performance data can look different from student to student depending on their strengths, weaknesses, and goals, but the intention is the same – to improve student learning outcomes (See Table 1). 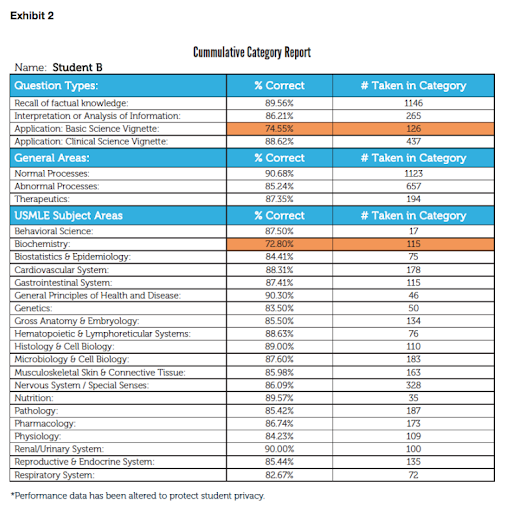 At The Ohio State College of Medicine (OSU), students are given detailed reports, made possible by the computer-based testing and reporting system provided by ExamSoft Worldwide, Inc., and a Tagged Electronic Database of Exam Questions (TEDEQ) developed by OSU. By utilizing a TEDEQ system, the lone measure of student performance is no longer their total score on the assessment, but rather a detailed breakdown of performance by question type, subject matter, question author, subtopic area, etc. This data is generated both on an exam-by-exam basis and longitudinal basis, and provided to the student in frequent intervals. The usage of TEDEQ data and reports by students varies greatly. The academic standing of a student is a large determinant of how to get the most value from the information TEDEQ reports present. The strong student, average student, and struggling student all interpret performance differently. The real-time reporting data provided to the student means different things to each of them. 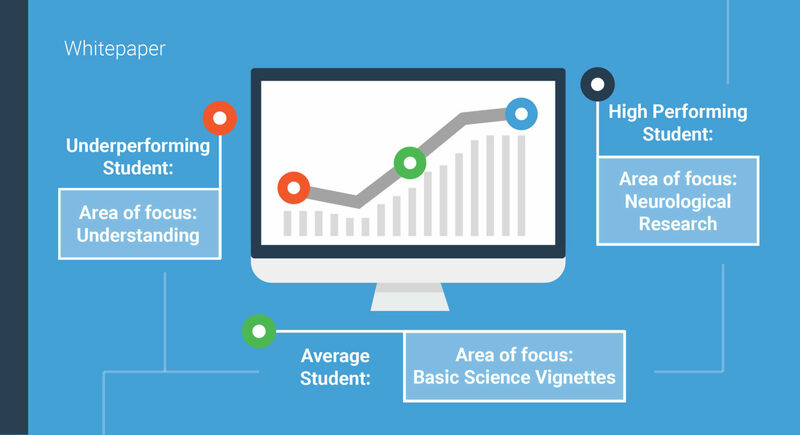 Thus, to illustrate how these reports are used by students, we describe how three students in varying academic standings utilized student performance data and benefited from this information. These archetypes are based on actual OSU students; for both privacy and illustrative purposes, the specific data have been disguised. Often, the struggling students have the most time and resources dedicated to improving their performance, because these students are the most at risk of not meeting the minimal competency requirements of their program. The need for improvement from the perspective of these students can be overwhelming. 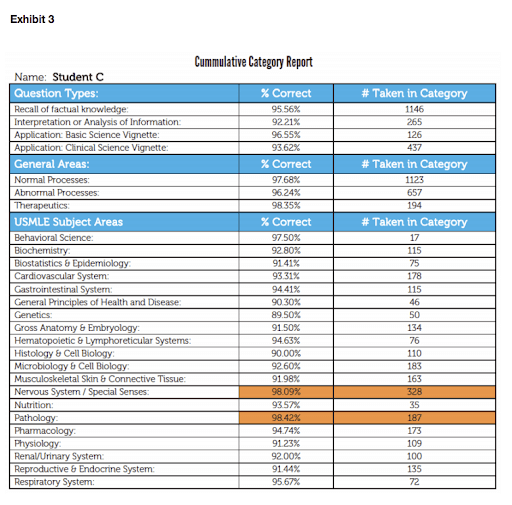 Student A is a student who has had difficulties reaching minimum required competency throughout the first year of medical school (See Exhibit 1 – orange box). Originally, the student ignored the performance feedback and focused on utilizing different study methods and increasing the amount of time spent studying. Only after those methods failed, did the student approach assessment and evaluation personnel for help in understanding the student’s performance and how to utilize the information. Student A discovered that he was performing well in subject areas where the content lent itself easily to memorization, while struggling with subject areas that required information to be synthesized for understanding. Student A had been attempting to improve in these areas by memorizing more facts, rather than focusing on how to relate the information to other processes. This led Student A to pursue assistance from an academic counselor for help in developing study methods that would make content connections rather than memorization of fact. Student A also began to better understand how to prioritize learning materials based on what was important enough to be assessed on exams versus what was secondary detail. Over time, Student A began to consistently meet required competency levels across the curriculum and was able to shift focus from meeting the minimum to finding ways to develop advanced areas of competency (See Exhibit 1 – green box). Student B scored consistently between the class average (~85%) and one standard deviation above the class average (See Exhibit 2). While at no risk of not meeting minimum passing requirements, Student B approached faculty to attempt to identify if there were specific content areas in which additional focus could improve performance on the 10-15% of material that was consistently being missed. Additionally, Student B’s subject performance breakdown indicated poor performance in Biochemistry. In light of this discovery, the student utilized the breakdown of performance by question author to identify which faculty members to approach for additional understanding of the material. Combined with the feedback about performance on basic science vignettes the student was able to improve his scores in the trouble areas by applying a more clinical approach to the study of biochemistry with the help of the specific faculty. topic or subject would come up that required some increased attention, for most part the student did not need to focus on performance improvement (See Exhibit 3). Instead, Student C utilized performance feedback to identify subject areas of greatest strength for further exploration. Analysis of the student’s longitudinal performance showed the most strength in the areas of Neurology and Pathology. These were subjects of focus the student had not considered before as potential areas of specialty or career pursuit. All students approach learning differently; they have varying needs and degrees of success. Regardless of these intricacies, real-time and specific student performance data is an invaluable tool for assisting them in reaching their academic goals. The personalized reports generated with the ExamSoft software, in conjunction with the TEDEQ system, provide a broad, clear picture of performance, and remove the guesswork from self-directed learning. Moreover, they empower faculty and administrators to target their interventions, and more effectively and efficiently (i.e. with less time) impact individual learning outcomes. There are a multitude of ways students find to take advantage of performance feedback. These examples highlight just a few of the methods students use to interpret this data and apply it to their academic careers. As usage of this data by administrators and faculty becomes more tightly integrated with support systems, counseling, and intervention methods, impact from employing this information for those purposes will be measured.